Obliterate the cost of consumer products with open hardware. If you're looking for free and open source designs to replicate on your desktop 3D printer, you have about two million choices. Because the open source ethic is rooted so deeply in the 3D printing community, many of the consumer products you would normally buy are already among those millions of predesigned products. You can download the designs and save a lot of money. My group has shown in studies in both 2013 (on a self-built 3D printer) and 2017 (on an out-of-the box 3D printer) that peer-to-peer sharing prosumers (producing consumers) gain an incredible return on investment: > 100% at minimum and more likely ~1000% by 3D printing products to offset purchases only once a week. Your "investment" in this case is an open source 3D printer derived from the RepRap (self-REPlicating RAPid prototyper). These open source 3D printers cost < $500 if you build one yourself or $1,250 to $2,500 if you buy one preassembled. Ebay has some for under $200. Downloading a predesigned open source file and clicking print is pretty easy. Here I will lay out the steps you need to take to make a product no one has open sourced yet. In addition, I will show you how to make it for less than the sales tax on an equivalent commercial proprietary product. In this article I'll share an example. My daughter recently started Nordic skate skiing, which means I needed a waxing rack. To get an idea of what that means see Steve Foreman's excellent how-to video on ski waxing. We went to the local outdoor sports store and the cost for a rack was a whopping $125. It was so expensive they had the box locked behind a glass display. All I needed to do, however, was see the basic physical makeup of the product to make a better one using the open source design method. To demonstrate the method, I'll walk through how I made my daughter a Wonder Woman themed set of ski wax racks for less than $5. 5 steps to leverage open source hardware. Obliterate the costs of consumer goods! 1. See if anyone has designed the product you want already. I recommend using Yeggi, which is a 3D printable search engine to find premade free designs. I knew there was at least one ski wax rack available because one of my Michigan Tech students had designed this excellent set of ski wax vices. Someone named Mosquito4 had made a complete skivise for downhill skiing as well. I didn't want a vice, however, I wanted a system for Nordic cross-country skis. It turns out that Jerry Trantow had made some Nordic ski wax table fittings if you already had a table. I didn't and just wanted to use the kitchen table, so I needed to make something new. Even though these designs were not exactly what I wanted they provided some good ideas on how I would do my design. To make it interesting I chose to design maximizing the printable components to minimize the cost. 2. Stand on the shoulders of giants and use similar designs for components of what you want. If no one has yet made what you want, then see if they have made anything similar. In my case, I needed some C-clamps or G-clamps to hold the skis to the kitchen table. It turns out Johann Joe had made and shared some pretty nice fully printable ones. Unfortunately, Johann only shared the STLs (STL stands for the STereoLithography CAD software file format). These are the files you need to print with and represent the outer surface of a 3D object. Ideally, he would have shared the source code for the design using an open source CAD package to make the design, but, no matter, most CAD packages allow you to edit the STL as well. 3. Use an open source CAD package like OpenSCAD to adapt the design for your needs. I can't say enough good things about OpenSCAD and the good people that have contributed to the code base and free tutorials. It is a powerful, parametric script-based CAD package. What this means is that it allows you to computer code 3D objects. If you know a little bit of coding, you will be right at home with OpenSCAD. I took some measurements of my daughter's skis to ensure customized designs. All measurements in OpenSCAD are in millimeters. I used the import command to bring the core part of Johann's G-clamp into OpenSCAD, and then because I wanted this to look nice I also used a round-edged cube library created by P. Towalski to build up the parts I wanted. 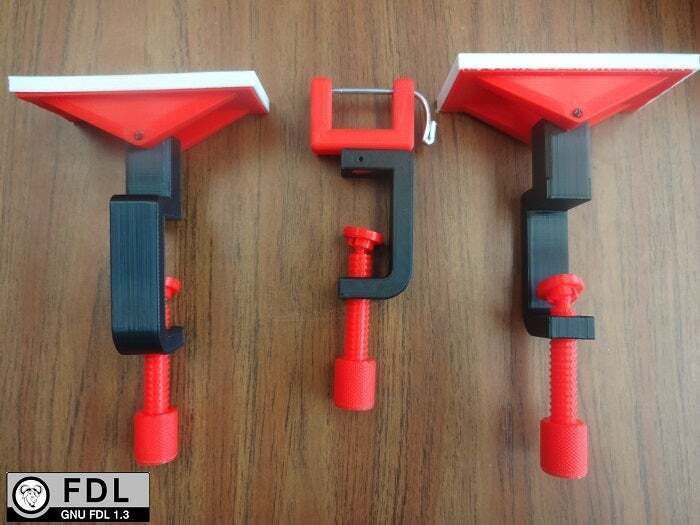 I made three clamps, the middle one that holds the ski by the standard binding and two tilting holders. The middle holder is the only one with any metal. I found the metal wire I needed from a broken clothes hanger from that same daughter's closet. I was careful to make all the parts easy to print from the surface of the print bed while minimizing overhangs. This meant that same middle piece needed to be in two parts. I did this because I wanted to minimize the use of plastic (you can do overhangs even with a single-nozzle 3D printer, but then you waste plastic building up support and have to spend time cleaning up your parts afterwards). Here I had the ugly overhang hidden in the square hole of the middle piece. 4. Print on an open source 3D printer. I printed all the parts in PLA (PolyLactic Acid) filament on an open source Lulzbot 3D printer. Buying a prebuilt 3D printer like a Lulzbot is easier for most people, but all the steps would be the same on a RepRap you built yourself like our MOST Delta 3D printer. To put the pieces together I used filament as rivets following a great tutorial by Jason Welsh who needed them for his line of open source 3D printable action figures. You can use a soldering iron, but if you don't have one, a clothes iron set to medium works just fine. 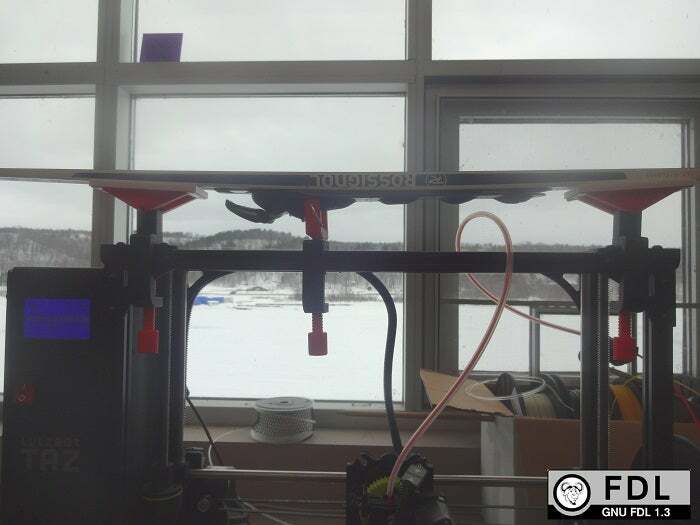 I didn't want the top of the skis to get scratched when in the mount, so I printed some covers with NinjaFlex filament. Later, I found this was not at all necessary. Finally, to add a superheroine flourish I borrowed the Wonder Woman design from a cookie cutter made by g33kgirl. 5. Share! You can download all of the ski wax system files for free on MyMiniFactory here. I was telling a friend on the ski trails about the great success (see the economics below) and she asked if she could have a Thor one for her family (all boys). With the power of the global sharing community she could (and with about five minutes of additional design time). 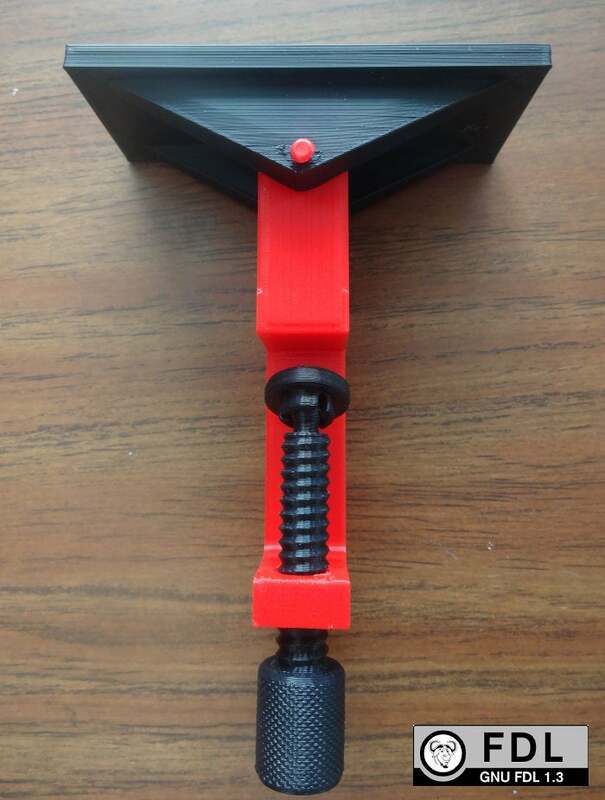 I looked up an OpenSCAD hammer for Thor. As luck would have it, legendary Vik Oliver (the guy who built the first RepRap child) had SCADed up a pretty nice Thor Hammer to be used as a pendent. (Mjölnir! Yes, Thor had a name for his hammer. Don't you name your tools?) Vik had modeled his version on a design posted on Wikipedia from an artifact in the Swedish Museum of National Antiquities. Are you starting to understand how awesome the sharing world is? 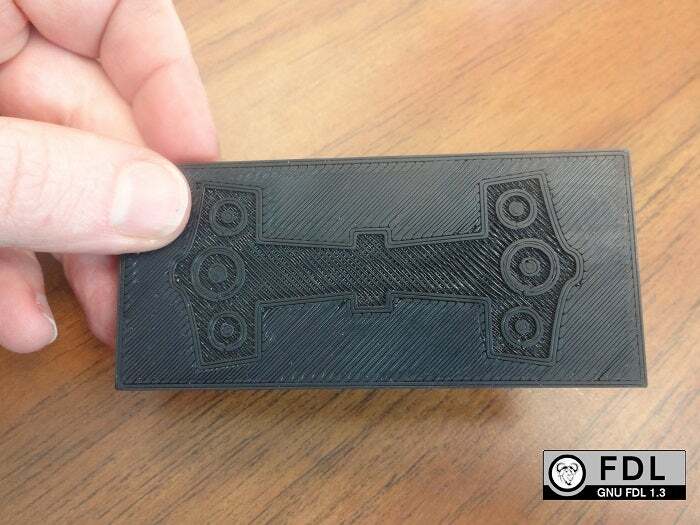 Because my second version should always better than the first, this time I cut the Mjölnir directly out of the two sides after mirroring it twice in OpenSCAD and thus had the design without the added costs and relatively slow printing time of NinjaFlex. Both the Wonder Woman and Thor's Mjölnir versions of the ski waxing systems worked great, looked cool, and destroyed the cost of a generic commercial product. By how much? Commercial PLA filament costs about $0.025/g and NinjaFlex costs $0.086/g, which means that the Wonder Woman hard parts cost $3.25 and the soft pads cost $1.73. 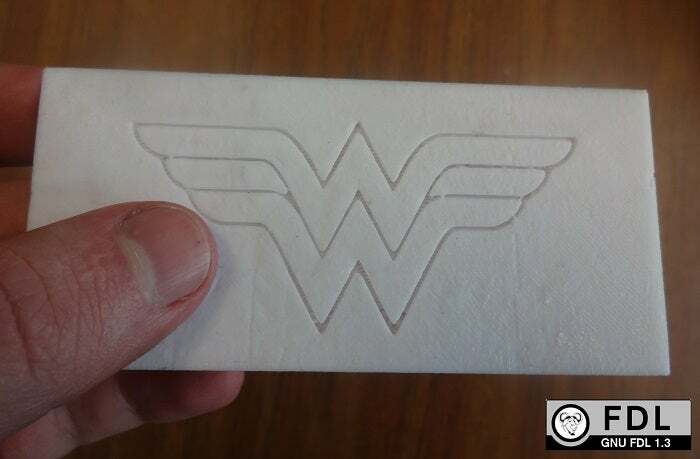 All in all, my completely 3D printable ski waxing system prints for $4.98 for the Wonder Woman version. This a whopping 96% savings from the commercial system. In fact, my design is not just cooler. As the tax in MI is 6%, the open source 3D-printed ski waxing system costs less than the cost of the taxes on the commercially available system. The Thor Mjölnir version is even less expensive because it is only in PLA and costs $3.33. This is not even as low as I could go because I could have used recycled plastic from a recyclebot to push the cost to a few pennies, but that is a story for another time. If you do not live in a tundra, you may not have the need for a ski wax rack, but that is part of the point. Whatever consumer products you need, chances are most of them already have an open source 3D printable version available. For uncommon products like a Thor-themed ski wax rack that no one has thought of yet, you can use this method. If you share, it makes it more likely that others will join the open source community when they make their less-common creations as well. We all win. The bottom line is that with a little practice working in OpenSCAD or other open source CAD package (e.g., FreeCAD) and the foundation of designs already available in the free sharing 3D printing community, you can save on specialty goods even if no one has gotten around to designing them yet. The open source approach to distributed manufacturing of consumer goods is real. It saves money—lots of money. It is here now and you can be a part of it. When you see it this way that's really money saving .. Nothing wrong with saving money and adding your own twist to it :D I love 3D printing, it's run being able to do this at home. I'm going to start messing with the modeling finally now that I freed up some time.